RasterEdge Interleaved 2 of 5 C# barcode creator add-on offers easy-to-use and mature APIs for C# developers to generate a customized Interleaved 2 of 5 barcode and draw created barcode on both raster image files and common documents in .NET developing platforms, without using other external barcode related third-party software. Compared to other C#.NET Interleaved 2 of 5 barcode generating SDKs on the market, this C#.NET Barcode Creator Add-on successfully stands itself out based on its outstanding Interleaved 2 of 5 barcode generating features. You can easily generator Interleaved 2 of 5 barcode and save it to image files/object using this C#.NET barcode generator control. The following steps will show how to create a Interleaved 2 of 5 type barcode encoding numeric data text "01234567890123456789" into the image object with XImage.Barcode.Creator. 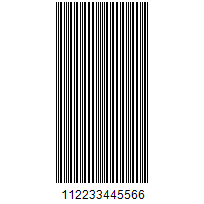 Please copy the sample code as follow to generator a Interleaved 2 of 5 barcode. In this section, we will give you a C# programming example on how to create Interleaved 2 of 5 barcode and insert created barcode on target image file. Supported image file formats are PNG, JPEG, GIF and BMP. Using this C#.NET Interleaved 2 of 5 barcode creator add-on, you can insert created barcode into specified area of your loaded image file. Using RasterEdge C# Interleaved 2 of 5 barcode creator SDK, you can also create and add standard Interleaved 2 of 5 barcode to document page using C#.NET programming. Supported document types are Word, Excel, PowerPoint, PDF and TIFF. The following C# code demo contains all the APIs that you can use to create and customize Interleaved 2 of 5 barcode on documents and image files in .NET applications.